Great 8!! In case this is your first visit to MyRideisMe.com, welcome to what I hope you’ll find is the best photos and info about easily one of the best indoor shows in the USA, and probably the world. 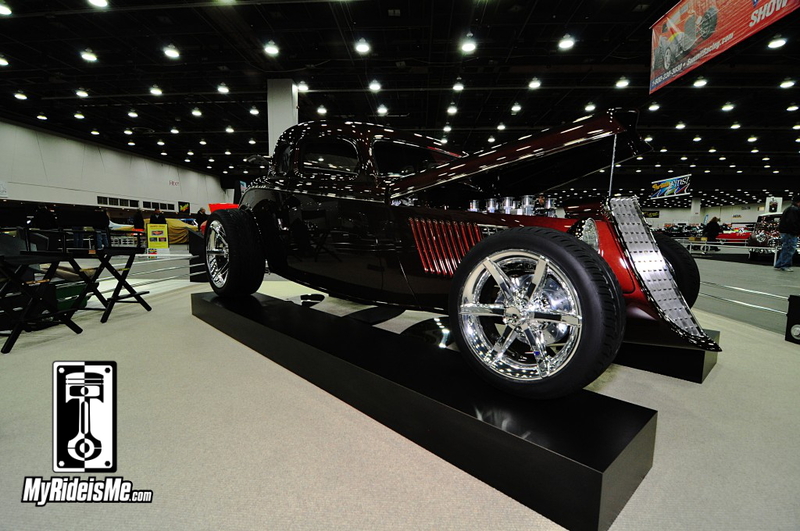 This is Detroit Autorama, and the BIG award handed out each year is the Ridler Award. 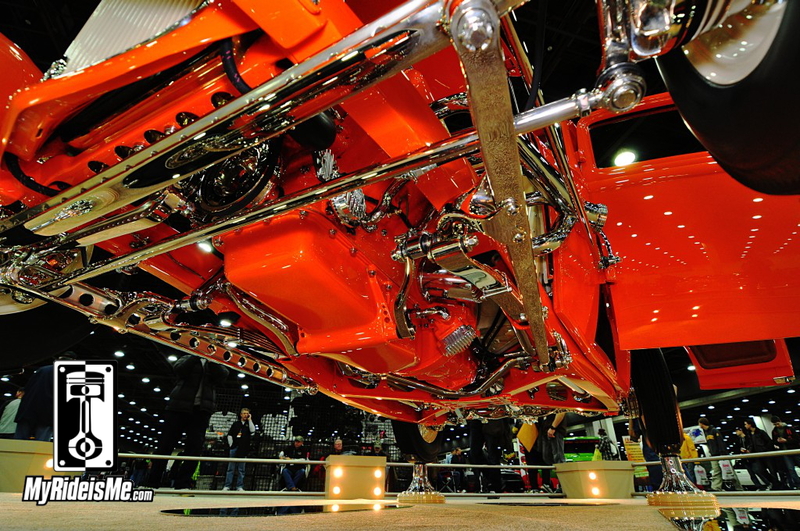 For this three day show, the first step in choosing a Ridler Winner is to pick the “Great 8”. These are the cars, “in the running” for the Ridler. 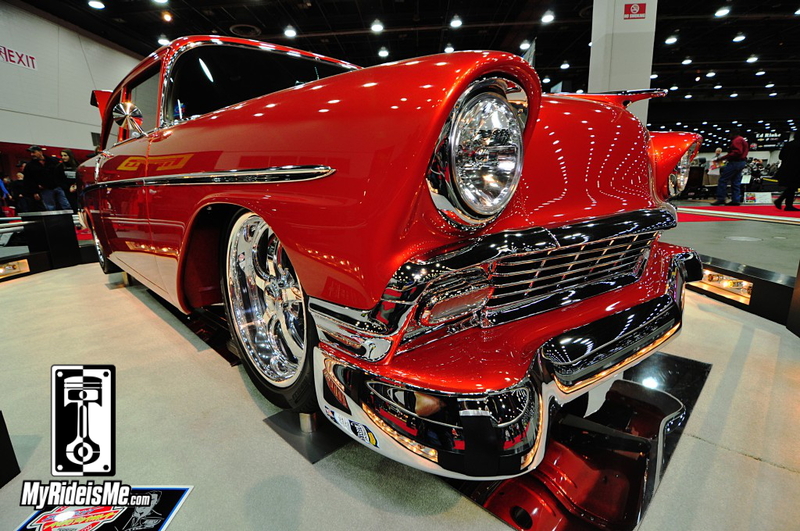 Looking for the 2014 Ridler Award Winner? Click here. Picking the Great 8, then judging what’s selected… I wouldn’t want that job! There are always a few cars where you just can’t figure out why they weren’t selected. It’s a tough competition, one that’s been going on since the 1960s. MyRideisMe.com usually does a “Not Great 8?” story for the ones that weren’t selected. 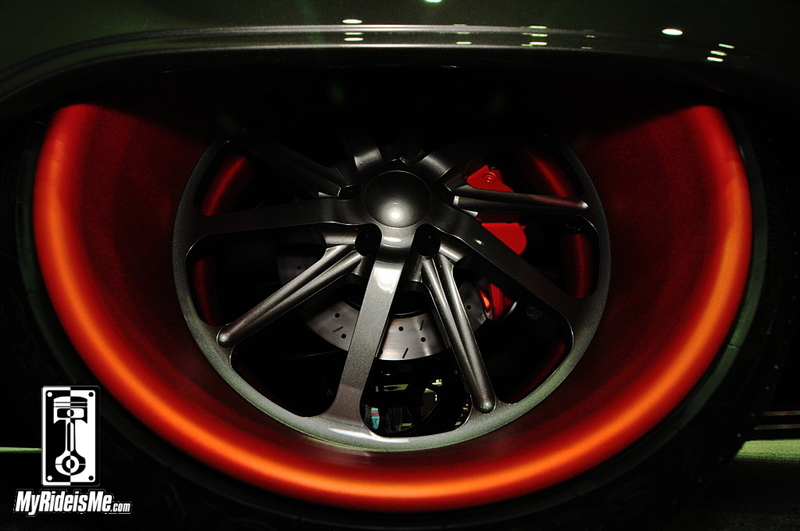 Favorite Detail: Just like for 2013 Ridler Pictures, I asked each builder one question. This year it’s tough because they can only pick ONE detail as a favorite. Some couldn’t and for some, I’ll show more than one. 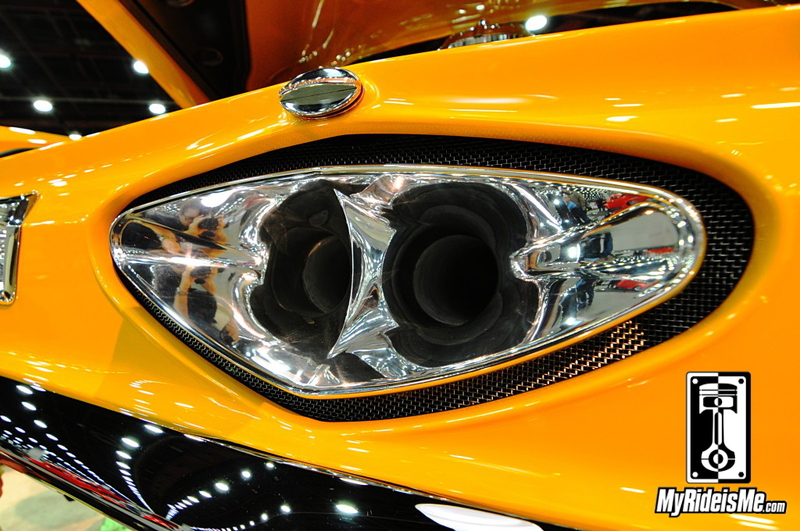 Either way, we’re trying to bring you the best of this amazing car show. Enjoy! 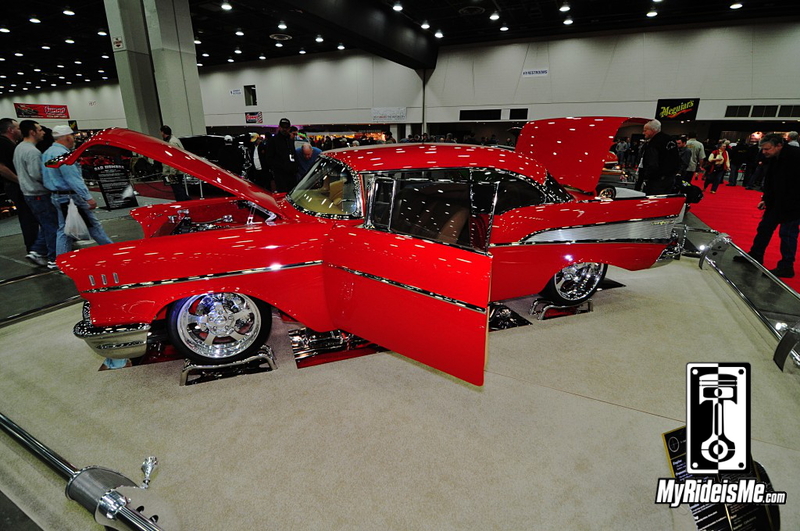 25 more photos of this car – 2014 Ridler Winner! Favorite Detail: Owner JF Laurier of JF Customs told me simply, “the shape”. I asked for more info and got the idea I was the only one missing the point. 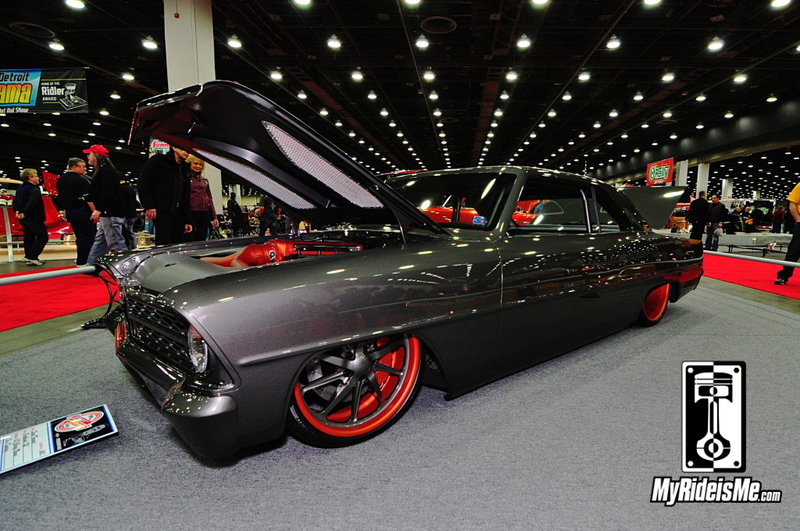 When there are so many custom tricks done to one car, maybe it’s not fair to ask? Then the Ridler Award judges took him away for the formal judging, so I’ll have to get more information later. 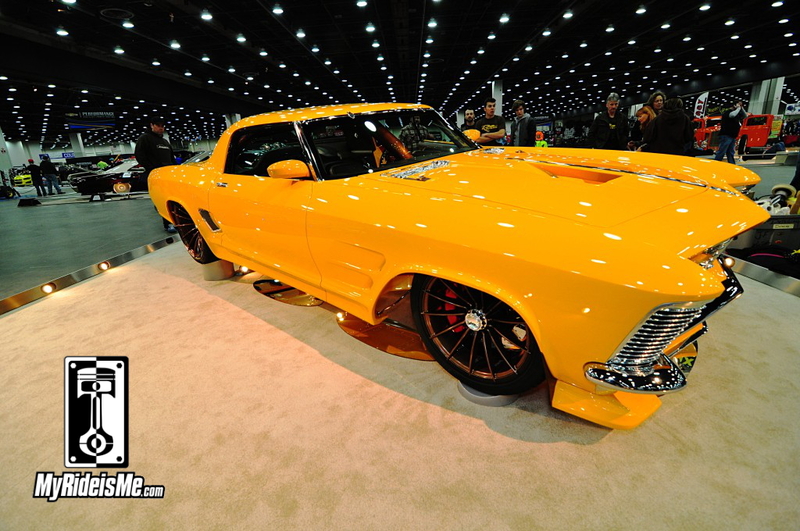 I’ll go on record early and say this will be your Ridler Winner for 2014. 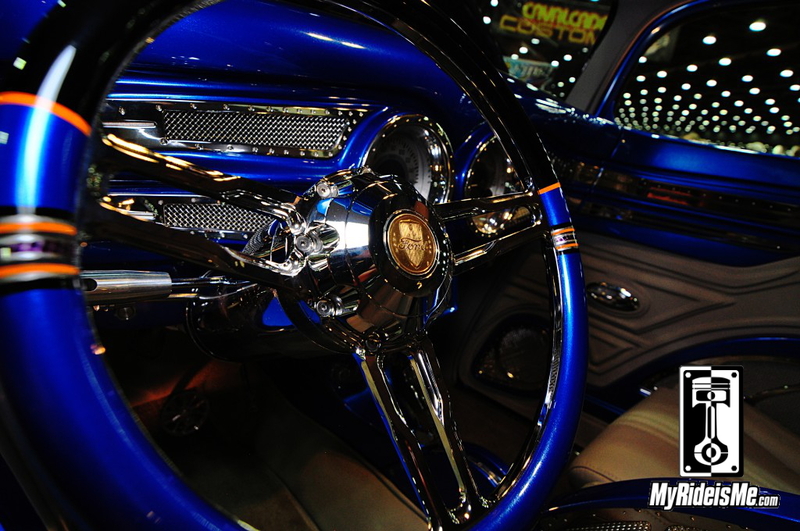 While the cars below represent fantastic builds and the best of hot rods, customs and muscle, JK’s Riviera nicknamed, “Rivision” wasn’t built to compete for the Ridler, it was built to win it. 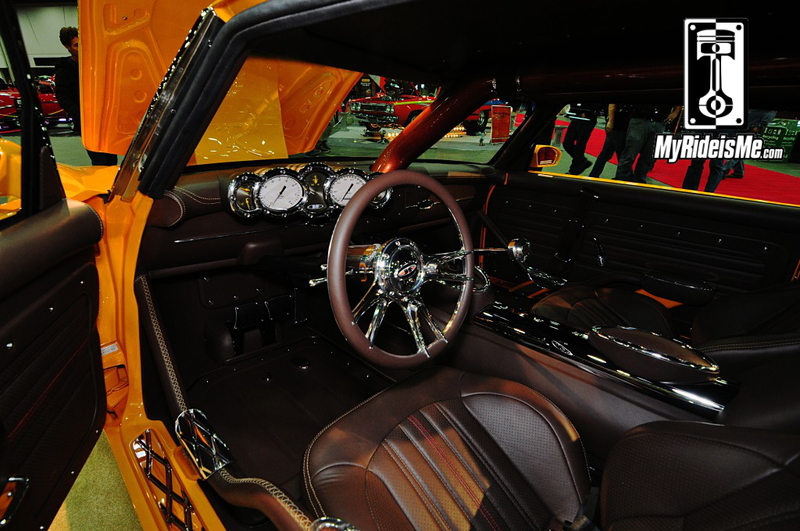 Now a two-seat, 850 horsepower, turbo’d six speed custom, this Riviera still carries the distinctive boattail design. I’ll save the rest of the details for the many other pictures I have when I write the “winner’s” story. 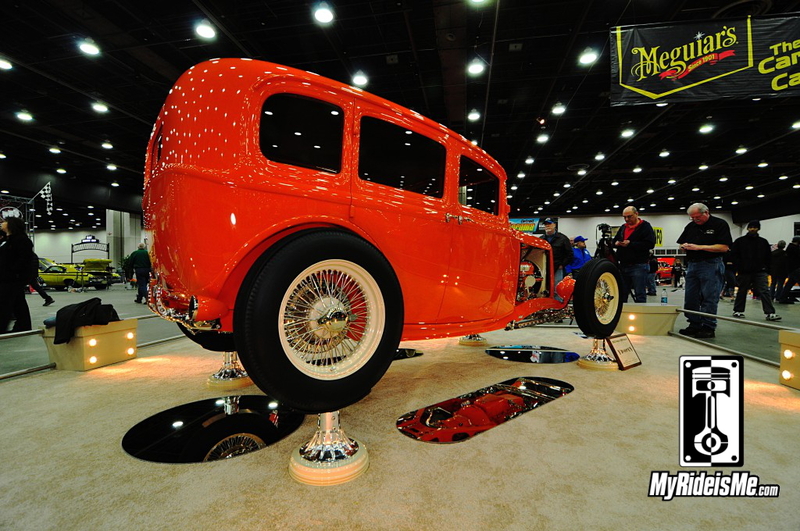 18 more pictures of this car – easily the Best 1932 Ford Sedan on the Planet! 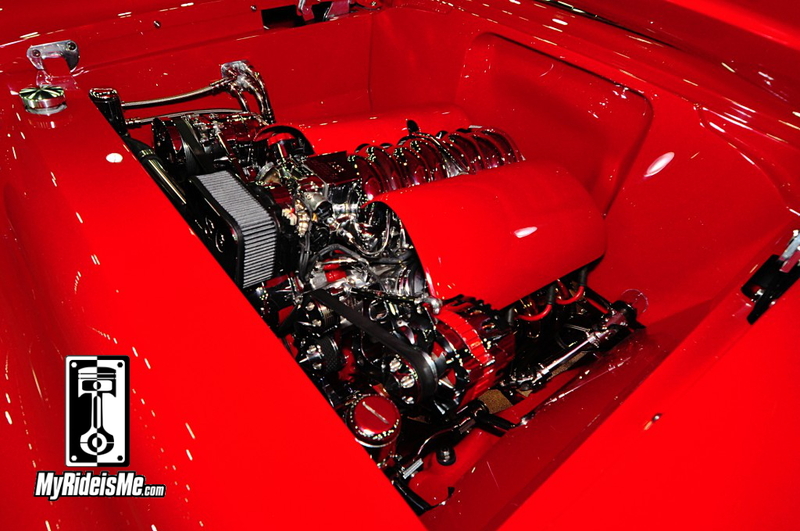 Favorite Detail: Here’s another case where Jeff Kensey, builder and owner of Hot Rods by JSK, had a really hard time picking his favorite detail… and again, with very good reason! This hot rod is beyond fantastic. 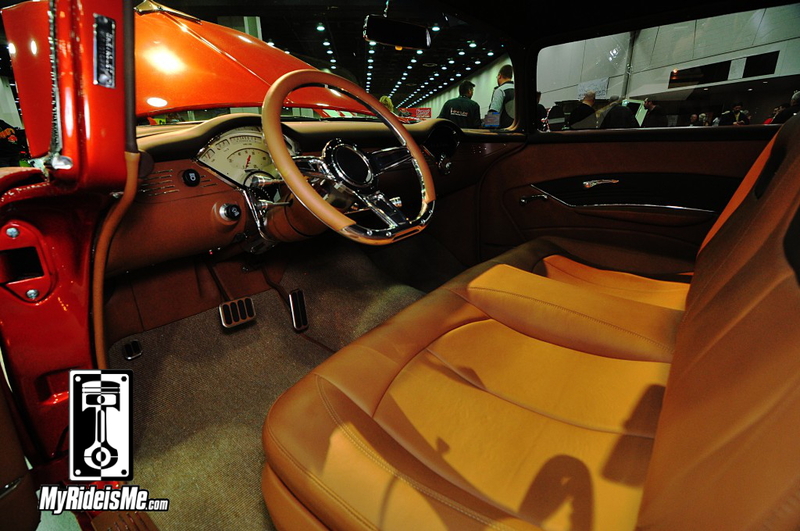 I’ll need another story to tell all the great details of this car too, but Jeff said his favorite was the pedal assembly (shown on the right). 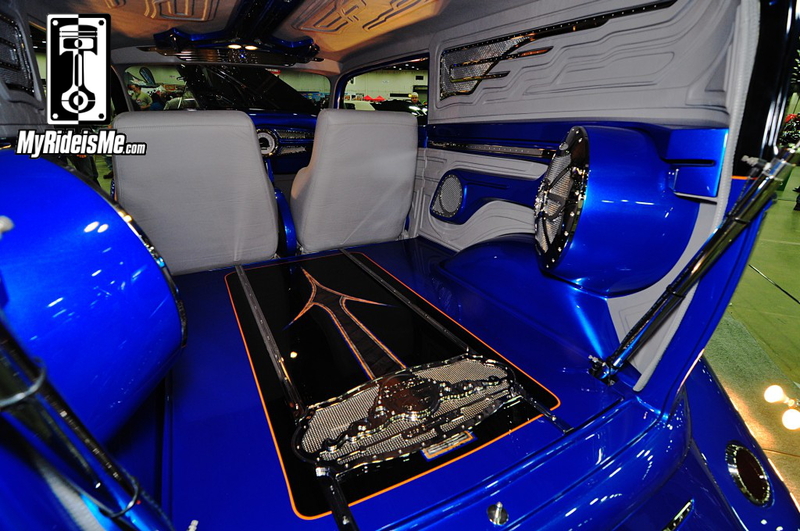 The pedals were all handmade and really set off the detail of the car. From there, take note of the vintage 312 Ford engine used with old school Hilborn injection converted to electronic with custom made scoops. Then, try to take in all the details of the front suspension (left picture). That’s the sway bar going the oil pan mixed in with all that beautiful chrome! And last… I don’t show it here, but the “B-pillar” the one between the doors, was removed. 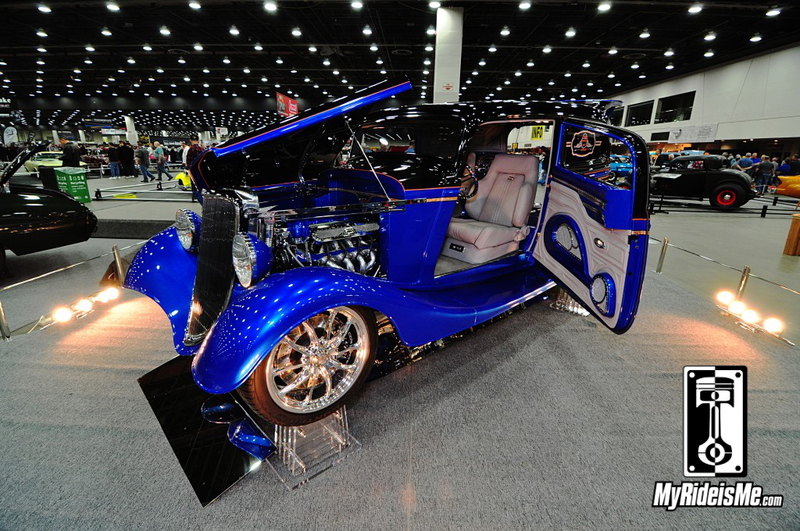 This is a 4-door any hot rodder would love to own! 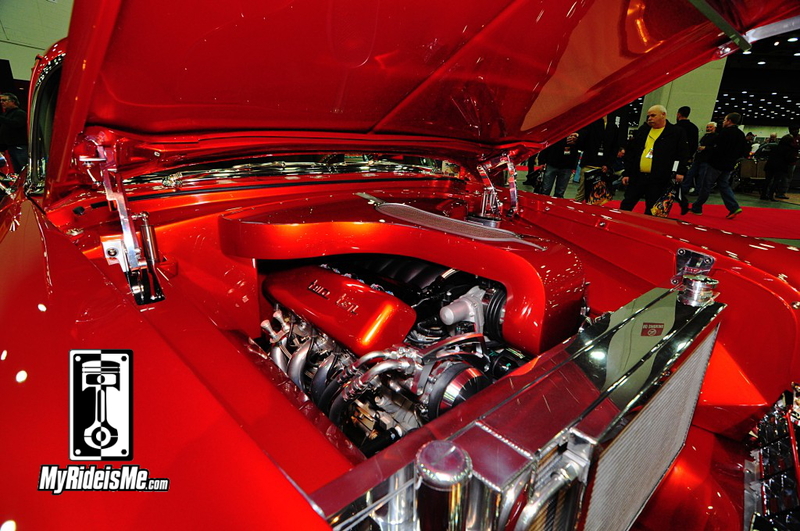 Favorite Detail: At least for Tom Manner, the builder of this killer 1956 Chevy 210 post, his favorite feature comes to mind quickly. 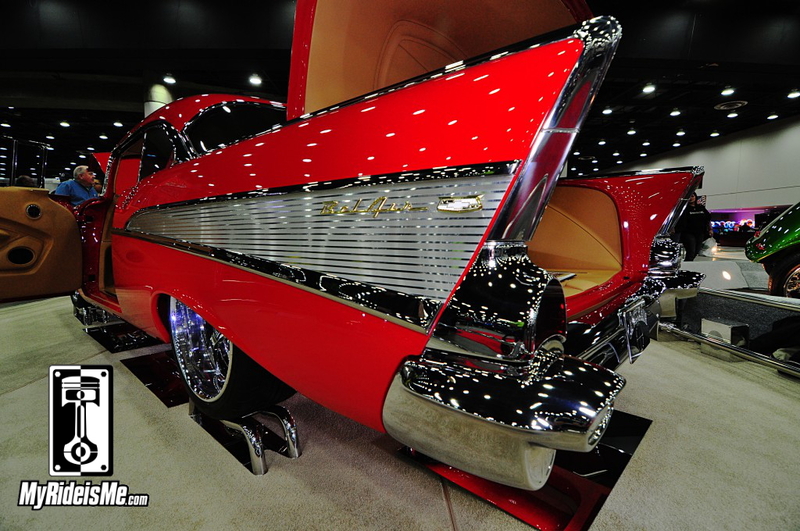 But for us… it’s a modification that covers the full length of the car! 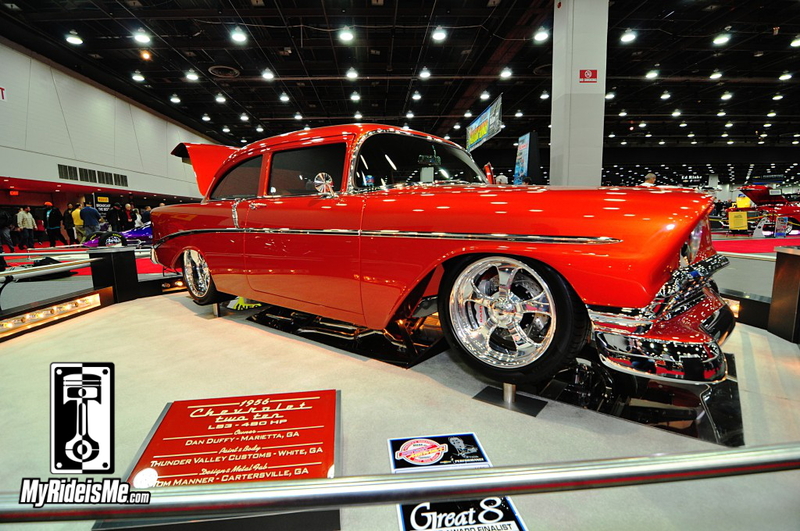 If you look closely, or pull up a picture of another 56 Chevy, you’ll see how Tom pie-cut about 3 inches in the front and tapered that down to nothing at the back. The section was cut following the contour of the trim using a template. The build book pictures show how nearly everything had to be remade to pull off this custom trick. 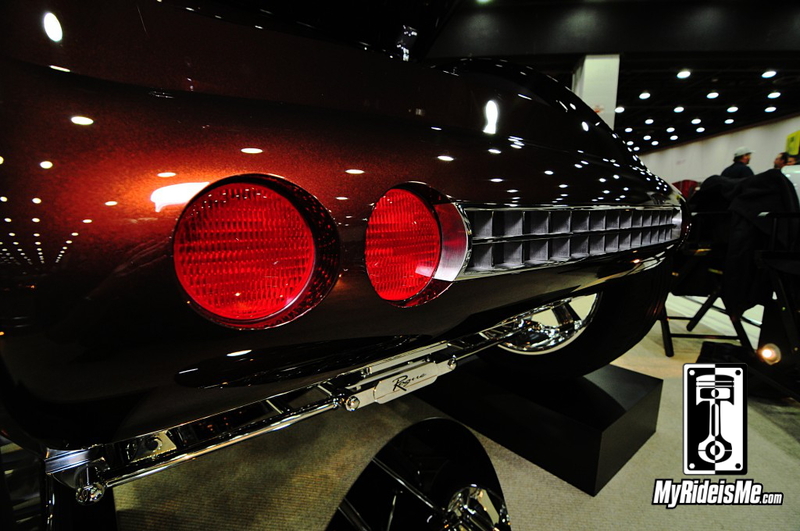 Up front, the normal 6-bar grille for a 56 Chevy is narrowed and only has 4. And the turn marker lights are narrowed too. It took 3 bumpers to make this one because Tom said the stock one, “Looked like a snow plow!” after all the other modifications. So what’s the detail Tim liked? He said the wheels and the stance and owner Steve Tornari agreed. The wheels are 22×13’s in the back with 20×8.5’s in front. Those are massive Pirelli 335-25 series tires sunk deeeeeep into the wheel well. 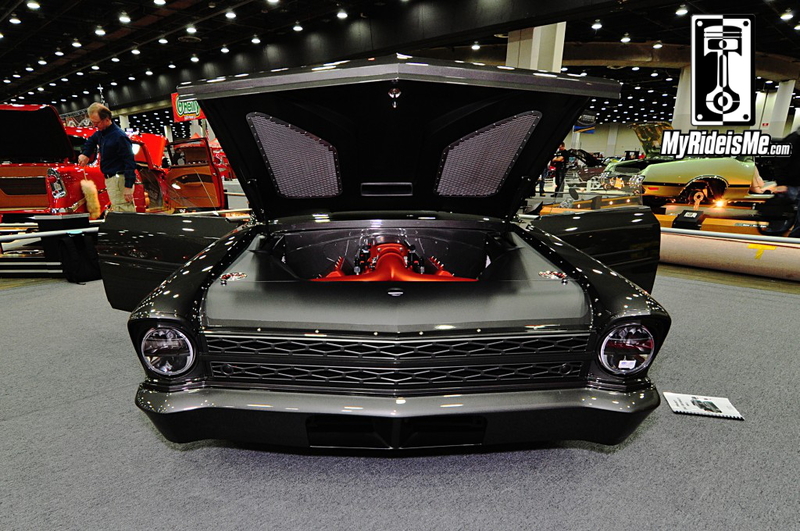 Famed painter Charlie Sutton, the painter of last year’s Ridler Winner, painted the Nova and nearly everything else but the wheels. Charlie did mixed up the color from, of all things, Kia factory colors! 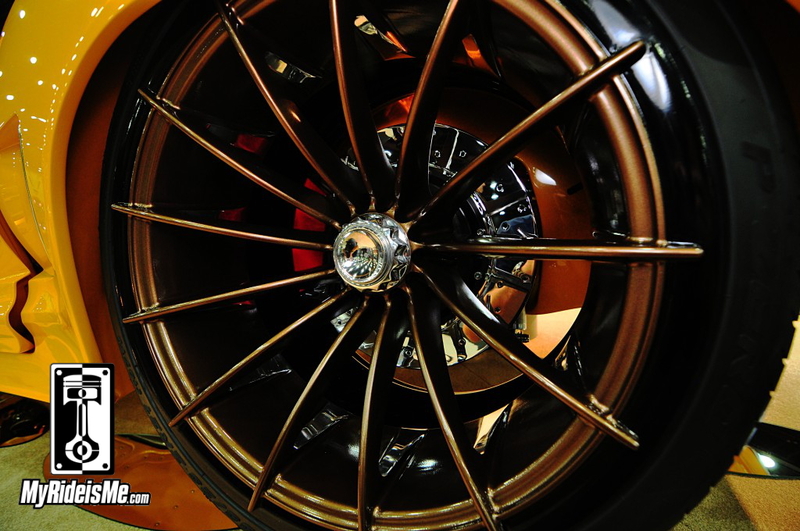 Tim liked how a wheel that’s been around for a while has a brand new style thanks to the custom paint treatment. Tim was also digging on all the electronics in the car. Accuair controls the AirRide system, but all that can be controlled from the on-board Ipad or from his phone app! Turn on lights, start the car, roll down the windows, all remotely. 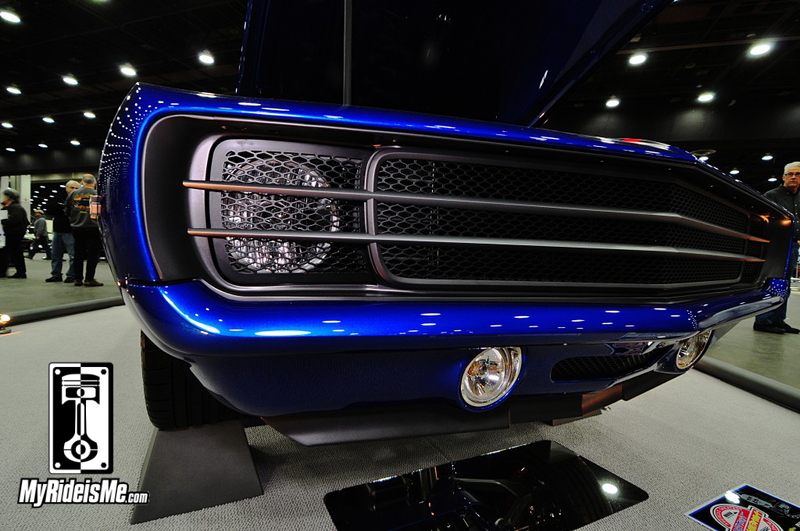 Favorite Detail: Speaking withe folks from Creative Rod & Custom, it didn’t take them long to point out the custom grille as their favorite detail. The grille was handmade from a design and sketch by Larry Pfaff before it was made by Special Projects Inc. a Detroit area concept car manufacturer. 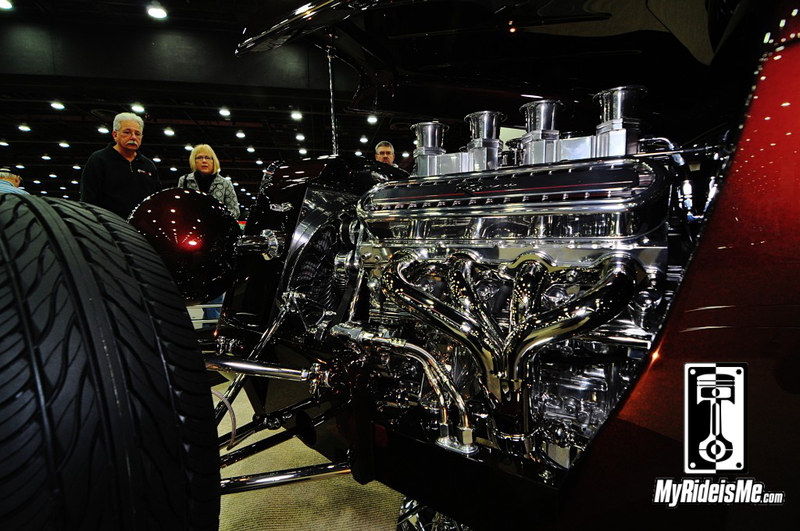 Special Projects has built som fantastic Big 3 concept cars like the Cadillac Sixteen car and the Ford Superchief truck. I think they’re right! 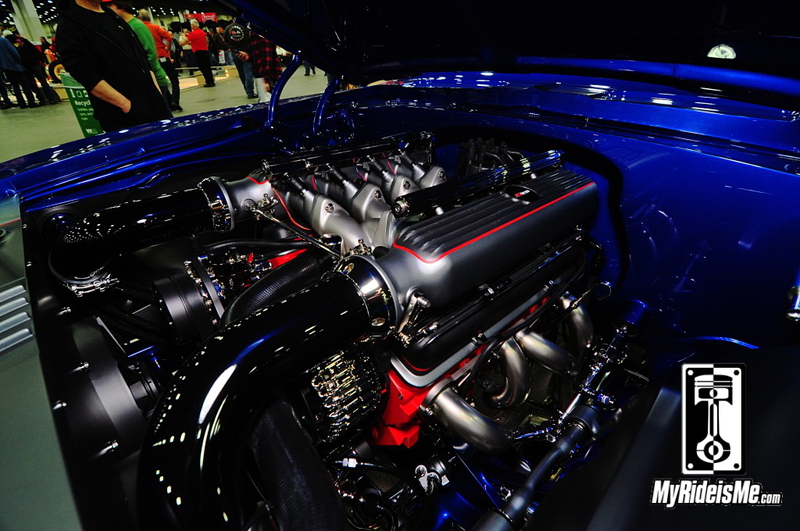 Our friend Bob Ream of Imagine Injection did the fuel system. Way to hit the Big D Bob! 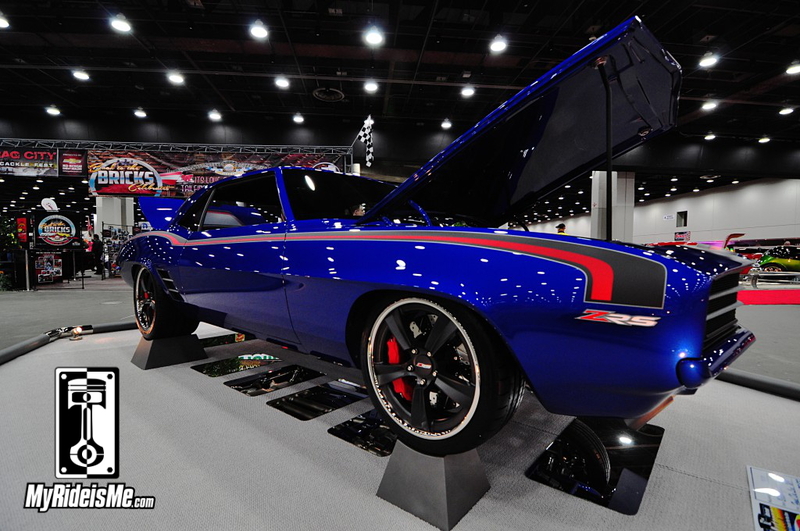 Favorite Detail: After so many people having trouble picking their favorite from their car, Jim Hubbell, the builder of this cherry 1969 Camaro knew what he liked right away. 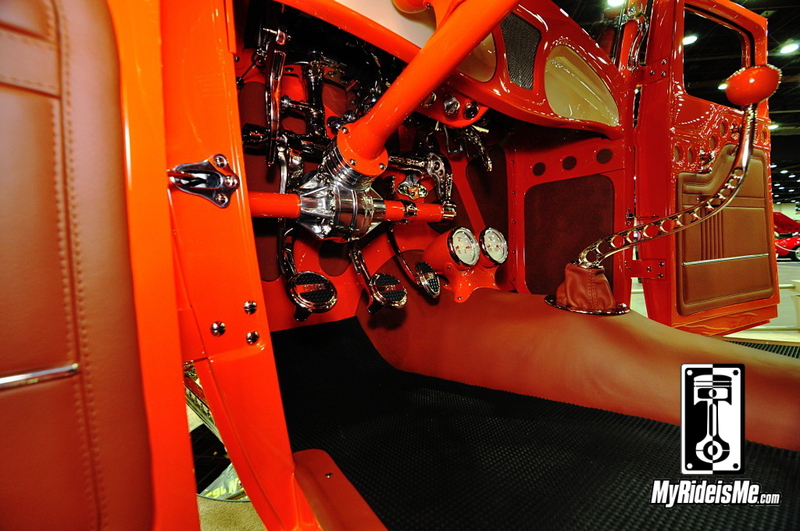 It’s a beyond rare, perhaps one-of-a-kind fuel injection system designed by racing legend Smokey Yunick. 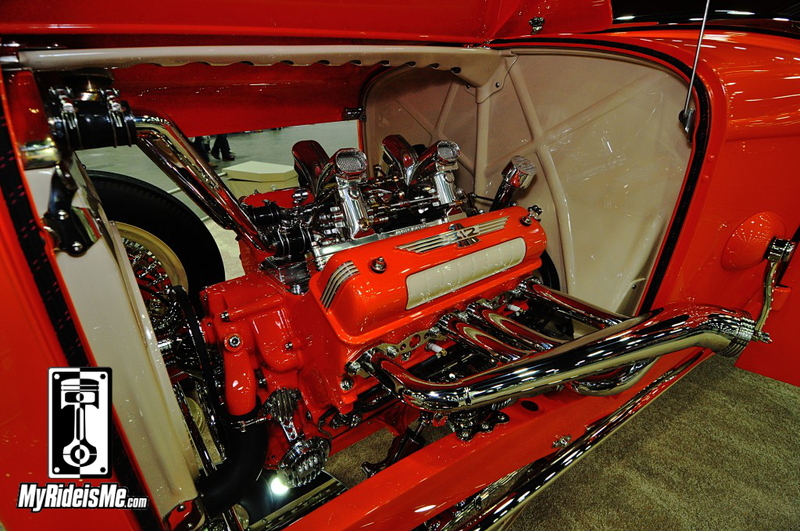 The system looks right at home with the fins on the injector plenums matching the finned valve covers on the World Gen1 427 small block Chevy. Jim says they wanted to keep a nostalgic look and I dig how they resisted the urge to run an LS motor. 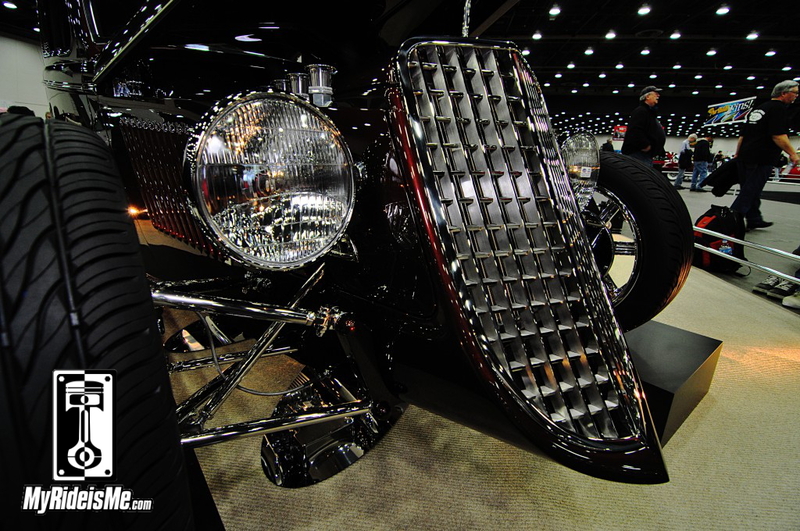 Favorite Detail: I had a great time chatting with Al Seese about his 1933 Ford Sedan. You don’t have to spend much time looking over the car to realize Al is the owner/operator of a machine shop. So many parts on this car are handmade by Al’s crew. Al could quickly pick his favorite though, it’s the coin in the steering wheel. (right picture) The “Ford coin”, so he’s told, is from the 1933 World’s Fair. Al picked it up at a coin auction for the ripe sum of about $17. Isn’t it funny what we like? The coin looks great and so does the rest of the car. Maybe my favorite trick is the A/C vents in the dash. See them? It’s the mesh opening where the cold air flows out. A trick solution to how to stay cool! Favorite Detail: 7 of 8 ain’t bad! 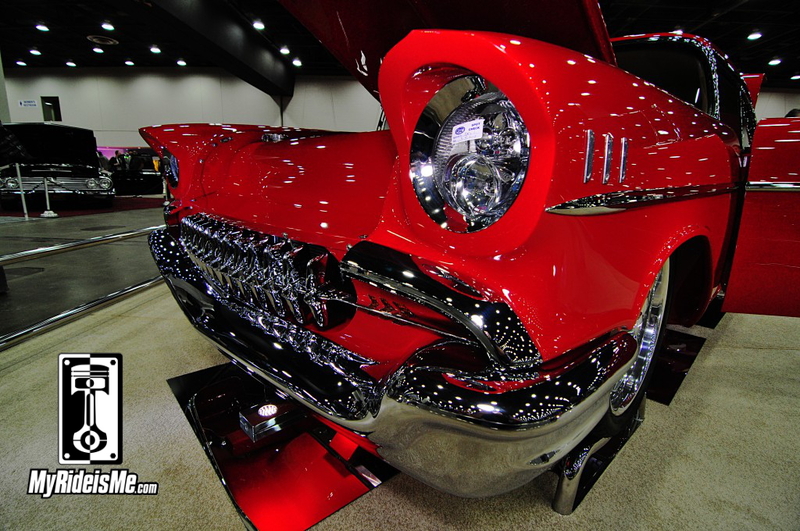 Hustling around the show, I never caught up with the owner of this tastey red 1957 Chevy Bel-Air. John and Phyllis Sadler own the car. The show card says the top’s chopped 1.5 inches. It’s very subtle and I guess that’s the point. I’ll try to catch up to the owners and get more details. There you have it… now pick one! You don’t have to be a member or sign up for anything to leave a comment. Tell us what you like! As a reminder… Rules for the Ridler Award are pretty simple: The cars should show: Creativity, Engineering and Workmanship. (What they don’t mention is that the winner typically shows all three of these in a way, most likely, never seen before or done in a way that’ll cause mouths to hit the floor) Just a few other rules, the Ridler contenders must be showing for the very first time and must run, drive and stop in a basic way. 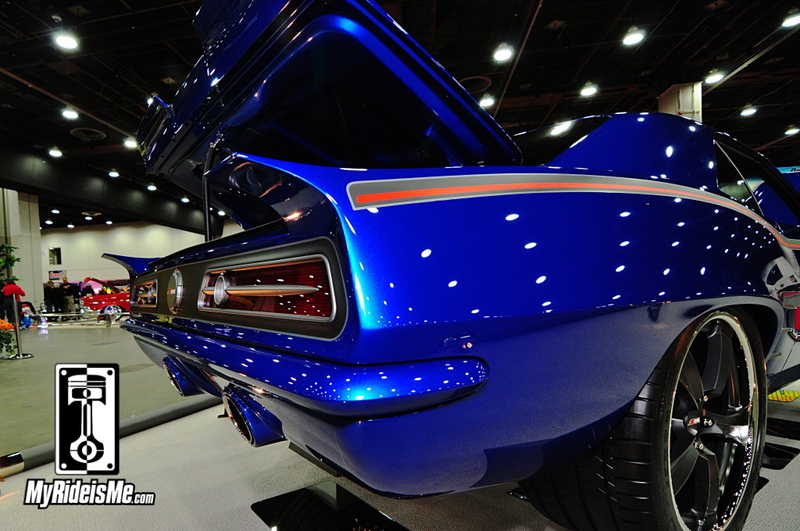 ** 2013 Ridler Award “Great 8” Contenders – 32 Pictures!! Thanks for the great pics and write ups. Keep up the good work! Looking forward to your other coverage. Well there be a should of been but not great 8 article this year? 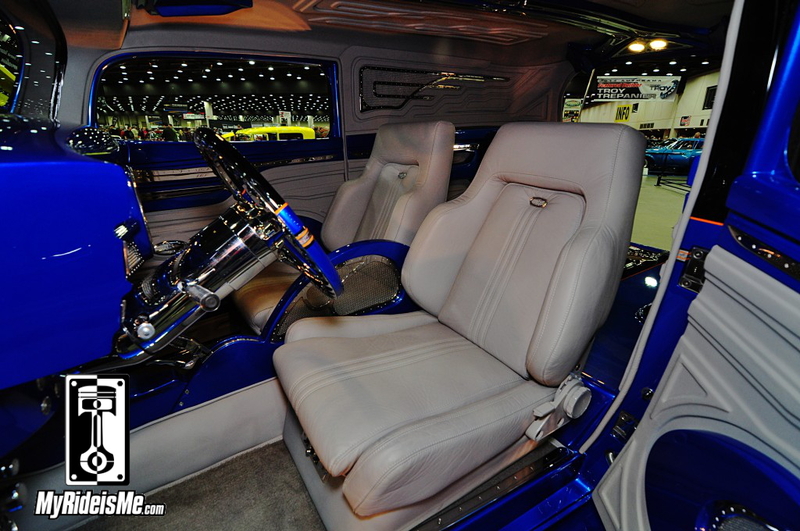 Word from my guy at the show is that the 32 ford 4 door should win over the riviera. Pikesan-we will see. I know this is JF’s 3rd or 4th great 8 car so maybe its his time to finally win one. Wow! Thanks! Your skills as Photog are becoming extraordinary!